This calculator will work out the radius of a circle, the diameter of a circle, the area of a circle, the surface area of a sphere and the volume of a sphere using any of those values as a starting point. Simply enter the desired value in the relevant box. Please use only numbers (e.g. enter 22 not 22 cm). This calculator only uses numbers. If you try to enter a unit of measure (e.g. 22 metres, 4 miles, 10 cm) you will get an NAN (Not A Number) error appear in each box. When you have entered the number that you know, click the button on the right of that box to calculate all the other values. For example, if you know the volume of a sphere enter the value into the bottom box and then click the calculate button at bottom right. 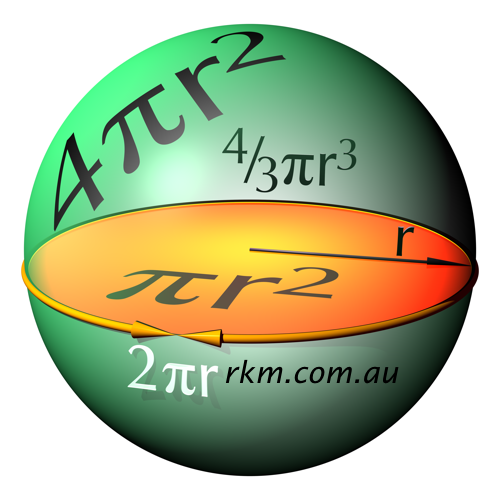 See animations of π / circle area / sphere surface / sphere volume / cylinder area / All calculators. To convert between lengths (e.g. centimeters to inches) see our Length & Distance Converter. For weights and volumes (especially in recipes) see our Recipe Converter. Cylinder: Calculate surface area and volume of a cylinder.